Usually my son and I got to BBRSP during spring break because it's not that crowded. I'd like to switch it up a bit and hit the BGWMA. I see there is a private campground just outside the area. Is Stillwell's going to be full during Spring Break? I'd like to stay at the campsites within BG. Seems little info til you get there and need permit. Any info on what camp sites are the 'best'? Will those sites be taken during Spring Break? I've long wanted to do Dog Canyon and Devils den. Looks like I could come from that side. I suppose we could stay at Stillwell and just day trip into there? ShaneA knows something, I think. That's good to know. As long as we find somewhere to sleep we are self sufficient. If we have to come back out to stay at Stillwell's then that's fine. 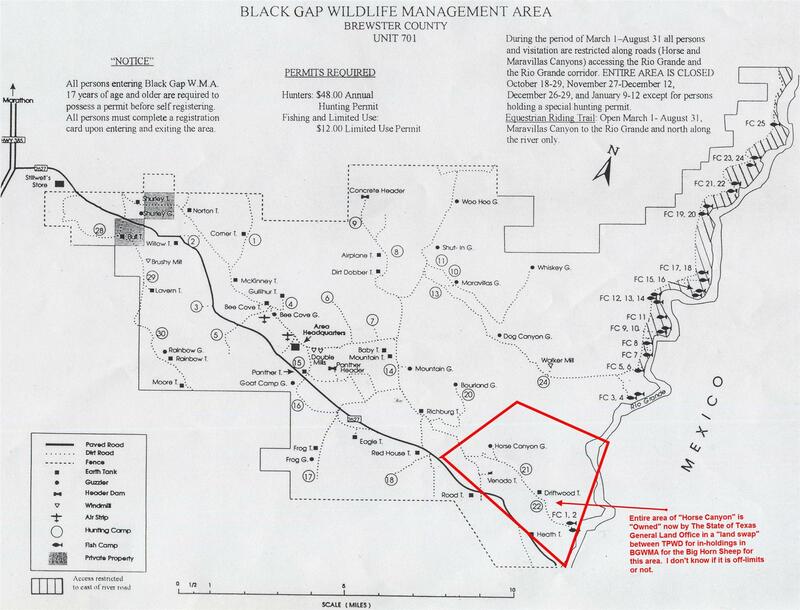 I doubt very seriously that Black Gap sites will be full unless that week happens to include a hunting season. To get a site, you must first have either a year-long hunting permit or a special use permit, both of which are available where hunting licenses are sold or on-line. Black Gap itself does not sell these permits. You then show up at the Black Gap HQ where there is a self service registration and where you select a campsite (a map is available there). Except for two sites located just outside the HQ area, you will need four wheel drive, high clearance to get to a camp site. I've never actually camped in the BG Management Area so I can't recommend any particular site. Thank you for the information. Somewhere I read the roads aren't as bad as bbrsp. Is that true? If that's the case then that's fine. Are all the little tiny roads I'm seeing on Google maps accessible? I know some are for research but there's a lot of exploring it looks like. That is correct. The only roads that can be driven are shown on the official NPS park map. We have been all over the park in high clearance two-wheel drive trucks except for the stretch of Black Gap between Glenn Springs and River Rd. BBRSP roads marked 4 wheel drive are much tighter (less driven) and can be rougher than any road in BBNP. You can walk or hike the ones that are not marked on the NPS maps that you may see on Google Earth but not drive them. Great. Good to know. I think I'll hunt down some canyons or cool terrain on Google and see if we can hike them. Any restricted areas if on foot? Not that I am aware of in the desert. Some back country roads/primitive sites are sometime temporarily closed due road conditions or bears and portions of the Chisos can be closed during certain times of year due to Falcon nesting but that's about it. Are you talking about the National Park, or Black Gap Wildlife Management Area? Well I believe this is the black gap forum and a thread about black gap. Did I miss something? I messed up then in that I was referring to the national park. My bad. I have been to and camped in BG several times but that was many years ago. Based on that long-term memory, the roads in BG are not as bad as the state park. Not as much brush and not as rugged. Did someone say BGWMA? This is my favorite place out in the West Texas Trans Pecos Big Bend Region. It is beyond desolate. I have spent over a week out there, and with the exception of my camping crew, we saw no other vehicles or people. Thus, you need to be 100% self reliant and there is ZERO cell service. Stillwell has a payphone, if you can find a prepaid payphone card anymore. It is a LONG drive from the interior of BGWMA to Stillwell and the Park. Plan on at least 90+ minutes from the fish camp. There are a number of sites you can easily get to with a standard car. Some have shade ramadas and most have fire rings. You can have a wood fire as long as there is not a burn ban in place, have to haul in your own wood. I carry two spare tires and a full tool box. Fish camps are neat and have large shaded areas and it is right next to the river. Pretty safe and secure there as there are no roads on the Mexico side of things. Chances are you will never see a ranger - self check-in and check-out. As others indicated must have a hunting permit or limited use permit and you can not get them there or at Stillwells. No water, no electricity, no toilet except at the front entrance. Now that I think about it, there maybe some toilets down near the fish camps. I vowed next time I went out there that I would spend $100 or so and rent a sat phone for piece of mind. There are so many things to see and do down there and explore and ride the roads that there is really no need to go anywhere else, except to Stillwell for more ice or gas. Of course, no trip is complete without a visit to the La Linda bridge. There are wild animals out there as well, I was fortunate enough to see a bear while driving down the road. During hunting season, only hunters are allowed in. At Spring Break, it will NOT be crowded - BUT - this depends on what the Texas Big Horn Society is upto. They have a spring meeting a work group every year and sometimes it is at BGWMA. You will need to check with them to see their dates. Also, large areas of BGWMA maybe closed due to the Big Horn mating season. I have never camped at Stillwell, but they do have full RV sites and camping sites as well. NOTE: Stillwell does have gasoline, BUT, it is not uncommon for them to run out of gas, especially during the high season, as the river outfitters use the La Linda crossing and also the interior fish camps for river running. I have ran into instances where there are quite a few people camped at Stillwell during Spring Break - mainly college kiddos - some of them on geology field trips. Also, Stillwell is used as an "over flow" area when the park is jammed up. Also note, if you are going into the park from BGWMA, you may encounter a long line of cars waiting to get into the park. My reason for liking BGWMA is that it is totally isolated, you can hike anywhere, you are totally on your own, quiet beyond belief, and you can have ground fires. We have also ran the river starting at one of the fish camps and then ending at another fish camp at the end of the area. You are required to have a river permit from the NPS that can only be got at the park. NOTE: Be vary wary of other vehicles - we encountered a Ford pickup that was Found on Road Dead - and was actually blocking our entry into the fish camp area. No way around him. There was a lot of oil on the ground, so it looks like he blew somthing. I have also had flat tires out there. To me, nothing worse than "limping" back out of BGWMA, or anywhere for that matter out there, on your only spare and the closest repair or new tire store is a heck of a long ways away. While knuckle driving just hoping you don't blow another tire.